Integral approached as Riemann sum based on tagged partition, with irregular sampling positions and widths (max in red). True value is 3.76; estimate is 3.648. 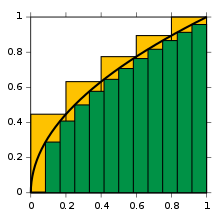 Riemann sums converging as intervals halve, whether sampled at ■ right, ■ minimum, ■ maximum, or ■ left.